Synopsis:Carmen Lee and Lawrence Cheng are married. Lawrence loves his wife and his mother. She finds her former classmates, such as Lawrence Ng. She has to face her husband, daughter and face confrontation with her mother-in-law; Loletta Lee is a villain, she's pitiful, but has the spirit of Ah Q. She has a relationship with Joe Tay; Elvina Kong has an obsession for dancing. She meets Carmen on the streets again, which triggers her memories of the olden days when she and her girl friends were in the dance class together. Meeting her girl friends again years later, she discovers they had all gave up on their dreams, except for her, who continues to pursue her dreams; Flora Chan is the CEO and the spokesperson of Aerobic Club. She is a very successful and wealthy perfectionist, but she looks down on others and is very unhappy with her girl friends; Fennie Yuen is a high official, she's really strict and talks in a bureaucratic tone and never talks about her background. As a young woman, she was actually very outgoing, but her personality was impacted by one incident. She has two sons, but she rarely gets to see them. She was married, then divorced and had an extramarital affair; Angie develops a "sister-brother" relationship with 6Wing@FAMA, 15 years her junior. He sees her as a beautiful elder sister and a goddess, while she's looking for her youth and wants an energetic life again. TVB series M CLUB (NUI YUN KUI LOK BO) two nights ago held the "M Club Premiere". The ladies Angie Choeng Wai Yee, Rachel Lee Lai Chun, Alvina Kong Yun Yin, even Fennie Yuen Kit Ying dressed provocatively for the occasion. They celebrates producers Eric Tsang Chi Wai and Joe Chan Wai Koon's birthdays. Carman Lee Yeuk Tung, Gloria Yip Wan Yi and Kong Yun Yin even kissed birthday boy Tsang Chi Wai. Rumored to have turned down a rich businessman's advances due to her son, Angie Cheong Wai Yee said that currently she is single and does not feel she has any suitor. She lamented, "Finding a man who shares the same values, admires my inside and also loves his son isn't easy, I would have to be destined to find him." She said that now she wants to make more series than dating. Gloria Yip Wan Yi has not acted in a long time. With the series premiere she admitted that she was very nervous. Speaking of the children not attending the premiere, Yip Wan Yi said, "They don't get to watch it until it airs. I won't give them any spoiler to prevent them from telling the story to classmates." As for the outside saying that she returned for the series without slimming down first, Yip Wan Yi said, "I never thought about a comeback, this time I only made the series for fun. My character has a little housewife figure, so I don't mind what viewers say. Earlier I even deliberately ate more to gain weight for the series." Lee Lai Chun in the premiere video tried to seduce Lawrence Ng Kai Wa and kissed Joe Cheng King Kei. She said, "In the series I had a daughter with my first love Cheng King Kei, so I wanted to get back together with him. On the other hand I also thought Ng Kai Wa had a crush on me. Although I had plenty of kiss scenes, the shoot wasn't awkward. After the shoot I no longer loved them!" Flora Chan Wai San was studying for her Master's degree and she was busy with her graduation thesis. In addition next week she will return to the Mainland for a series. Thus sh would not be able to attend the remaining promotional activities. Busy with her divorce during the shoot Kong Yun Yin said that the production sped up her recovery period. Tsang Chi Wai after watching the premiere video stated that he was almost in tears. He did not want any pressure, and since the premiere date happened to be a public holiday he only wanted good word of mouth and declined to predict rating. Eliza Sam Lai Heung played the daughter that Lee Lai Chun abandoned. She kept looking for her mother and thus applied to be an instructor at Kong Yun Yin's dance school. She said, "I am not too coordinated but in the series I had to keep dancing. Luckily the choreographers worked hard to teach me. The instructor knew how my background was so I wouldn't 'stink'." The Eric Tsang Chi Wai produced TVB new series M CLUB (NUI YUN KUI LOK BO) two nights ago aired its first episode. He took the cast to dinner and to watch the premiere together. The first episode's average rating was 25 points and a peak of 26. Chi Wai two nights ago said that he would not have any rating pressure, but he has already promised the entire cast to take them on a trip around the world if the rating reached 40 points. Two nights ago aside from Chi Wai, Carman Lee Yeuk Tung, Rachel Lee Lai Chun, Fennie Yuen Kit Ying, Alvina Kong Yun Yin, Lawrence Ng Kai Wa, Gloria Yip Wan Yi and Eliza Sam Lai Heung attended. An instructor earlier, Teresa Mo Shun Kwan was also present. Chi Wai said that this time was his treat, because the business rule was the most senior paid. As for ratings, he joked, "If it reaches 40 points, I will take the entire cast on a trip around the world, 35 points I will take them to Europe, 30 points I will take them to Asia, 28 points I will take them to Cheung Chau." He also joked that if the rating warranted a trip around the world, they might not only make a sequel but also babies. Chi Wai admitted that he wanted the series to have the best rating of the entire year. He also said that starting Monday TVB will air its purchased series JOURNEY TO THE WEST, which might have great rating and would bring viewers into M CLUB. Chun Mui admitted that she did not mind Chi Wai's joke that they might have a baby, as she liked children; however she said that even her daughter was 17, perhaps she might be better off waiting to be a grandmother. Chun Mui continued, her daughter is currently studying in Canada. They would only have contact several few days. Was she afraid that her daughter would bring back a foreign boyfriend? She said that she did not get to be afraid. She had no discrimination and believed that her daughter would tell her if she was dating. Was her daughter as pretty as she was? Chun Mui said that her daughter had an aura. Kai Wa in this series was surrounded by actresses, Chun Mui would even touch him and seduce him. He said that he had no kiss scene in the series but denied that his wife did not approve. In his other series JOI JIN MING TIN he had many kiss scenes with Kate Tsui Tsz Shan. Kai Wa also pointed out that this series was a lot of fun, as he has never played such a character. "Young people want to watch young girls, the series has them. Older viewers can also watch their former goddesses." Loletta Lee laughed: "I wouldn't mind! But I better just wait for grandchildren instead!" She expressed that her daughter is already 17 years old, currently studying in Canada. She does not mind if her daughter dates. Venus Wong, who plays the younger version of Loletta Lee, was not able to attend the banquet, however the day before, she was caught making out with Eric's son, Derek Tsang on the streets; therefore she was accused of only getting this drama opportunity because of her boyfriend. Venus' manager did not deny that the two were dating, but expressed that Venus does not know Eric personally. Yesterday, Derek accepted a phone interview and admitted that he was indeed dating Venus, but supported his girlfriend by stating that she earned the opportunity with her hard work. Asked why they did not publicize their relationship? He said: "We didn't hide it on purpose, but we were afraid if we publicized it, people would have misunderstandings!" Ratings wise, TVB drama "Ruse of Engagement" had an average rating of 28 PTS on their finale, peaking at 30 PTS. 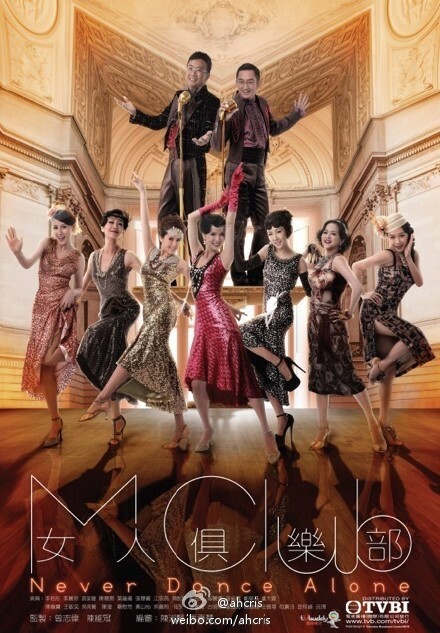 "The M Club" which broadcasted on Monday, had an average rating of 25 PTS, peaking at 26 PTS. The Communications Authority Bureau received 15 complaints on the finale of "Ruse of Engagement", stating content was too violent and bloody, a police drama being turned into a romance, etc. It's a surprise to see the return of TVB's actresses from the 1990s-2000s in Never Dance Alone, and many of them are as beautiful as before. I don't know any of the newbie actresses, but I'll give it a shot because of the veteran actresses' appeals. Carman Lee is beautiful and doesn't seem to age. 1 May – Rumours are rife that Hong Kong actress Flora Chan is not on good terms with rest of the cast of the currently airing drama, "Never Dance Alone". As reported on HK Channel, the actress who portrays Diana, the villainous CEO of D Dance Fitness and the rival of M Club in the new series, reportedly had not been very cooperative since day one. Said a source claiming to be close to the cast of "Never Dance Alone", Flora had been hesitant to accept the supporting role offered by producer Eric Tsang and only took it due to her husband's persuasion. "Flora always looked gloomy and remained distant. Whenever her scene was completed, she will be the first one to leave rather than socialise with her co-stars. She even did not communicate well with the crew," the source alleged. The actress has also been absent from most the series' promotional activities, to which the source said, "The PR team wanted the promotional events to be attended separately by the casts. Carmen Lee and Rachel Lee were to attend as a team, Angie Cheong and Elvina Kong in another, then Gloria Yip and Fennie Yuen, while Flora will appear on her own." "However, it was difficult to get Flora to come. Even when she did pick up her phone, she would use her classes as an excuse not to go. Even when we arrange the promotions at night for her convenience, she would still make excuses," the insider added. Flora Chan has yet to explain her side of the story. 30 Apr – Actress Fennie Yuen, who made her return to TV through Eric Tsang's "Never Dance Alone", stated that she may not be filming another series soon as to recuperate from the tedious filming schedule. According to On CC, the actress who had been on hiatus for nearly ten years before her comeback through the TVB series, stated, "It's hard for me to work more than 10 hours. I'm not young anymore, so the long hours are difficult." Fennie admitted that she even had the thought about quitting, but still continued on, saying, "I wouldn't want to leave behind a negative image as soon as I return!" In regards to her future projects, Fennie said that she will only accept filming projects that will not be filming until the wee hours of the morning. "I love this job, but I think I will leave it to the younger artistes," she added. With more and more complaints submitted to TVB regarding the poor quality of the mainland drama, "Journey to the West" on the station's 8.30pm slot, it seemed that the series that occupies the subsequent time slot has been affected as well. As reported on Mingpao, not only did the mainland drama receive a lot of flak from the public, its viewers' ratings also dropped to a meagre 21 points from its premiere's 25 points. Unfortunately, the Eric Tsang-produced series, "Never Dance Alone" has also felt the repercussion of viewers' wrath, as its ratings were reported to have dropped from 26 to 23 in its second week because of the failure of "Journey to the West" to maintain viewers' attention towards the station. However, TVB executive Tsang Sing Ming still believes that the mainland series will slowly pick up and stressed that they have no plans to cancel it. Tsang also urged viewers to continue watching the series, stressing his belief that "Journey" will be able to slowly gain viewers' attention. Hong Kong actress Rachel Lee (also known as Loretta Lee) has no qualms admitting her cosmetic procedures and had confessed to have undergone Botox injections twice to slim down her face. As reported on Sina, the "Never Dance Alone" actress made the confession during her appearance at the TVB series' promotional event just recently, saying, "I did use Botox to slim my face, but I don't dare use other methods." Rachel made the response after Netizens made comments about the actress' stiff and expressionless face in the series. However, the 48-year-old actress stressed that she has stopped taking the injection when she began filming the series for fear that it would affect her acting and facial expressions. "I do understand that I can't rely on Botox to slim my face and I still need to exercise," she added. Hong Kong actress Carmen Lee says that starring in "Never Dance Alone" has again increase her popularity with the public. According to On CC, the actress who attended the promotional campaign for the series in Tsuen Wan alongside other cast members including Rachel Lee and Anjaylia Chan, stated that she could feel the impact of filming the series, as more and more people beginning to recognise her again. The 40 year-old actress, who was last seen in "Legendary Fighter – Yang's Heroine" back in 2001, stated, "My relative asked me the schedule of "Never Dance Alone", saying that she really wants to watch it. Once they saw Lawrence Ng on the magazine cover and told everybody that he is a friend of mine." "Even kids started to recognise me whenever I go to the kindergarten. They keep telling me that they saw me on TV," she enthused. When asked if the reception makes her want to do more TV series, Carmen replied, "I am not sure, but I will consider it if there is a suitable role, even if it's a motherly character." Actress Carmen Lee, who recently made her TV comeback through Eric Tsang's "Never Dance Alone", expressed her interest to join the film adaptation of the series if it was to be made. Previously, the Hong Kong media reported that Eric Tsang was extremely happy with the series' success and planned to make a movie version with its original cast members reprising their roles. On CC reported that Carmen, who appeared on a radio interview recently, stated that though she is uncertain about Eric's actual plans, she is very interested in the project. Carmen also hopes that the original cast will also return, especially good friend, Rachel Lee and enthused, "Rachel and I are good friends. When Eric organised a celebratory trip to Taiwan, Rachel and I went there together!" Meanwhile, co-star Angie Cheong stated that she is unsure about the film project, as she is busy with her business in mainland China, as well as taking care of her adopted son, Hanson. On the other hand, it was also rumoured that the series' antagonist, Flora Chan, has been left out from the movie casting list, presumably due to her lack of cooperation during the filming and promotion of the series. Carman Lee, Loretta Lee, Fennie Yuen and Lawrence Ng etc attended a promotion activity for TVB series "Never Dance Alone" in a shopping mall in Yau Tong yesterday. Loretta's popularity has risen since the series of "Never Dance Alone". She has been getting plenty of job offers to do commercials recently. She revealed that she had a nightmare the night before "My ex-husband called me and asked me to be the spokesperson for a beauty product. I didn't know what to do, I wasn't sure if I would get money from him. So far he hasn't given me any alimony, I hardy have any contact with him. (Why didn't you ask him for maintenance money?) I don't think I could get anything from him. I sued him once, my daughter is nearly 18 anyway, don't think I can get anything from him. If he doesn't want any responsibilities, there is nothing I can do about it. I have forgiven him already, let's hope he stays away from me and doesn't give me any troubles." It's Lawrence birthday today, the organizer prepared a big birthday cake for him to celebrate his birthday a day early. Lawrence expressed "I have been busy working these days, I don't always have time to get involved with the promotion activities for the series". Lawrence went on to say that he will be flying to Shanghai to film a new movie soon, therefore, he may not be in Hong Kong for the final episode of "Never Dance Alone". Speaking about the rumor that the film version of "Never Dance Alone" is being planned; Flora Chan and Loretta Lee may not be included in the cast, Lawrence replied "I didn't hear Eric mentioned anything about the film version. Flora is very busy looking after her daughter as well as studying, we shall wait and see." - ATV's "My Date with a Vampire" had an average of 1 PT during the same primetime time slot as "Journey to the West". - Communications Authority Bureau received 32 complaints on "Journey to the West". - TVB received 1 complaint to cut broadcast of "Journey to the West". Hong Kong actor Lawrence Cheng joked that he felt helpless over the recent rumours of his death that had been circulated online. According to Mingpao, Lawrence stated that the death rumours were not done intentionally but a mere misunderstanding among Netizens. Playing the role of Carman Lee's husband in "Never Dance Alone", Lawrence said that his character died in one of the scenes, and a Netizen had screen captured the said scene and uploaded in on social media. "They uploaded a photo of [my character] Wong Kwok Leung's death, and it received a million likes on Facebook. But some people thought that I was really dead and wrote 'RIP 1955-2014." said the actor. "I want to clarify. I am still alive. It's only my character that died. But I am still happy that my character was able to attract that much attention!" the actor enthused. Winning praises for her performance in the TVB series, "Never Dance Alone", actress Anjaylia Chan recently expressed her hopes that her good fortune will continue through other acting projects. According to On CC, the actress, who recently went on an interview at a radio station to promote the finale of the said series, revealed that she is quite heartbroken now that it is coming to an end. "I have come to love them all. What are we going to do once the finale is over? We will seldom see each other then," said the actress. Anjaylia also revealed that she has been receiving quite a number of offers ever since the series aired, and hope that it will maintain that way throughout her acting career. "I really wish that the current situation will continue. Before doing "Never Dance Alone", people kept telling me that I look older than my actual age. But after making the series, they now realised that I can look young too," the actress enthused. Meanwhile, Anjaylia revealed that she and her co-stars have made an arrangement to watch the final episode together at an event to be held at a shopping mall. Complaints- "Never Dance Alone" received 15 complaints, regarding the drama's plot being uninteresting, also not specifying that the story isn't an original local story, the plot was illogical and nothing new- "Journey to the West" received 12 complaints, requesting the time slot to be changed, special effects are too exaggerated and rough, etc.